The red and white are Canada’s national colours, recalling both the name of the Club and the focus of its mission. The embattled edge refers to the Club’s building. The trillium is a reference to the Club’s location in the province of Ontario and the maple leaves stand for Canada. By indicating the four directions of the compass, the arrangement of leaves represents an attitude of exploration and outreach in all directions. The lion – here coloured blue – taken from the arms of Canada and holding a banner bearing the traditional cipher of the National Club, represents the membership’s readiness to safeguard both the heritage and the future of the Club. The beavers are a national emblem, a symbol of industriousness, and their collars repeat the floral emblems in the arms. The supporters stand on paving stones, indicating the Club’s urban location. IMPRIMIS CANADA, meaning “Canada, first of all” – which is used by the Club in the form “Canada first” – marks the Club’s founding in 1874 as a meeting place by the “Canada First” movement, a Canadian political movement. 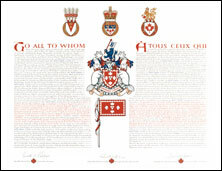 The announcement of the Letters Patent was made on November 22, 1997, in Volume 131, page 3589 of the Canada Gazette. 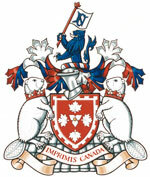 Original concept of Roger Lindsay, assisted by the heralds of the Canadian Heraldic Authority.